Growing up out East, I didn't really have a lot of ideas about what the heck that Disneyland was all about. In a pre-internet world, my only insights into the place - and indeed the mere fact that it was distinctive from Magic Kingdom at all - came from two sources: the 1990 "The Disneyland Game" published by Parker Brothers - where I first learned that the castle out there wasn't like the castle I knew, and that the Haunted Mansion looked even less like the gothic structure which had so impressed me. It took a few years, but the next bombshell was a VHS tape called Disneyland Fun. That was how I learned the words to Grim, Grinning Ghosts long before it was possible for me to get to Magic Kingdom regularly. Long before I knew what the Matterhorn was, I was trying to pause the tape to figure out what the heck the monster inside it was. I still watch Disneyland Fun the night before every trip out to Disneyland, because once you get as familiar with the parks as I am, some of the things that really make you feel like a kid again come from unexpected places. I didn't get out to Disneyland until I was nearly an adult, so a lot of my key formative impressions of the place came through such twice-removed sources as VHS tapes, TV broadcasts, books, and much later on - the internet. I devoured library copies of The Art of Walt Disney and Disneyland: The First Quarter-Century for any hint of the atmosphere of the place. And very high on my list of early impressions about Disneyland was breakfast at Riverbelle Terrace. I did not yet even know its name, but I recognized that wrought iron patio instantly upon seeing it. Although the tradition of the Mickey-shaped pancake hasn't totally vanished from Walt Disney World, the adorable fruit faces lasted only a few years after I began visiting, and the notion that I could enjoy that again out West stuck strong with me. Seeing the beautiful, open-air patio only impressed me even more. Perhaps it all goes back to one of the few keenly remembered thing about one of my earliest trips to Walt Disney World, in 1992. My family stayed at Dixie Landings and I was entranced by the Mill Food Court - the endless pancake operation at the griddle, seeing the pancakes set up and get flipped through the glass window, and the hot morning Florida light filtering through the glass enclosed room stays with me to this day. Perhaps on some deep level I connected to Riverbelle Terrace for being the new equivalent of that distant memory. Something about such a peaceful location in such a bustling intersection stuck strong in my mind, and does to this day. Few things feel more authentically, uniquely Disneyland than sitting out on that patio with a cup of coffee admiring the view towards New Orleans Square. Earlier this year, Disneyland announced their intention to move breakfast to the nearby Rancho del Zocalo. While I'm sure the Mickey pancake will survive and there's certainly nothing special about the food at Riverbelle on a taste level, it is a tradition none the less. The feeling of being out on that patio really is something distinct that I feel won't translate to Rancho. So one overcast Southern California morning last month, I set out for my last Mickey pancake, camera in tow, in an attempt to capture something of the atmosphere of the morning bustle of Riverbelle Terrace. It's nice to know that the beautiful dining room will still be in use, and the kitchen will likely be putting out far better food than it ever has. But the thing about Riverbelle Terrace is that it was one of those spots at Disneyland where you could get onto the wavelength of the past. While you were eating there, it didn't seem so long ago that it was called the Aunt Jemima Pancake House and Walt Disney himself was walking Main Street. There was something comforting about knowing that that restaurant had been turning out box mix pancakes since 1955. Sitting out on that patio was good for your soul. So grab your $9 pancake and let's take in one last breakfast on the Riverbelle Terrace. Why on earth are they ending the breakfast at River Belle? Is this temporary while they are mucking about with ROA? For me the standout item is the cinnamon roll. The icing is incredible. I have found out that closer to home here in Orlando, Publix has a cinnamon roll with a similar icing. I myself was always a fan of the "steamboat willy with a mouse pancake"
Here is to hoping its change for the better,not just change for the sake of change. We're probably close in age and I remember being completely confused when I first saw the Disneyland Sing a Long video. I'd been to WDW a few times already and was shocked to see that Haunted Mansion and the castle looked so different. Too bad I've only been to Disneyland as a younger kid and don't have the opportunity to go back soon! Great video! Shout-out to "Disneyland Fun"! The best Disney park promo video of all time. Having breakfast at the River Belle Terrace was a 50+ years tradition for me whenever I visited Disneyland. I always ordered the Mickey Mouse Pancakes and Steamboat breakfast with orange juice and coffee. They used to serve it all on real dishes and utensils, but later switched to paper plates and plastic utensils so the experience was downgraded through the years, but it was still a ritual tradition as part of my visit. I even remember when this place was Aunt Jemima's Kitchen as I've been going that long. Needless to say, I won't be having the Mickey Mouse pancakes at Rancho del Zocalo as it just isn't the same to me. Time to find a new tradition for breakfast. Thanks for a wonderful article about one of my longest standing traditions at Disneyland. I can relate to this story immensely. My first trip to WDW was a year after yours and we also stayed at Dixie Landings. I was young, but my near-photographic memory still has that trip etched in my brain. Disneyland Fun was also one of the first times I really noticed the differences between the parks. Another was an older Burnbalm book that featured a park map inside. Looking at that map, my little brain was blown. "What the heck is Critter Country?" "New Orleans Square? Where's Liberty Square?" "You mean Mansion and Pirates share the same land??" It's laughable looking back at it after acquiring a library of books on Disney history, but that's how familiar I was with MK. Anyway, your story really resonated with me. I feel exactly the same way about how breakfast at the River Belle Terrace - especially on the patio - is a uniquely Disneyland experience. There is something about the pastel colors, the glossy white wrought iron railings and chairs, and the tassled umbrellas that are all so DISNEYLAND! to me in a way that I can't fully articulate. The romanticized southern building with its slender columns looks more mid-twentieth century than mid-nineteenth century, yet that is part of its appeal. I will miss having breakfast here and hope in time it returns. I sincerely hope breakfast returns to the River Belle once all the mucking about with the Rivers of America is finished. It's too precious an experience to vanish forever. Sometimes I worry that Disneyland's management doesn't care about the individual guest experience unless they can directly squeeze money out of it. They keep taking away the things that we would use in order to devise our own unique, personal, non-branded traditions. I can relate to first impressions of Disneyland being formed by indirect sources. When I was growing up, my impression came from watching the original Mickey Mouse Club on Canada's Family Channel (our equivalent of the Disney Channel). Of their promotional vignettes, the one that stuck out the most for me was running around Fort Wilderness. You can imagine how crestfallen I was when, at the age of 27 in 2005, I finally got there and it was closed down! As an adult, my impression was best formed by the video A Day at Disneyland, which I found in a local thrift shop. 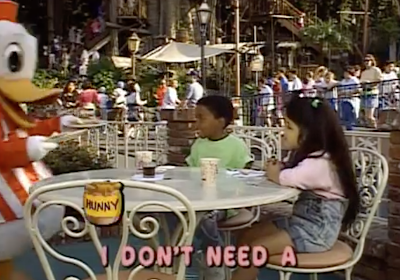 That video alone locked my mind in an ideal image of Disneyland in the mid-90's, just after Fantasmic opened but before Indiana Jones found the Temple of the Forbidden Eye. That, in turn, implanted a lot of things in my head that led to some disappointment, like not being able to see the Main St. Electrical Parade ON Main St. But even as I type this, I can hear the soundtrack to the video in my head. Anyways... Breakfast on the River Belle patio has always been a tradition for us as well. I was sold on the legend that Walt himself would take his breakfasts there. I personally can cook up a better plate of eggs, sausage, and pancakes than they can, but that's not really the point. It was just lovely to sit there and take in the relative peace of a morning on the Rivers of America. As a teenager I used to go to Disneyland several times a month - back when you could just buy a general admission. This was pre-passports and pre Annual Passes! I used to grab breakfast at the American Egg House in Town Square. It had a lovely patio, but also had an indoor seating area with a faux night sky with twinkling stars. I used to love it!